Nev’s Netflix Test And Some Stuff You Might Like. Carrying on the theme that perhaps one of the things the older generation ought to be doing is providing exposure to the younger lot who’ll have to be minding the helm when we start having to be reminded what day of the week it is while nurses are reading old issues of The Comics Journal aloud to us to try to spark some fire into our cloudy minds, Here’s a couple of previews of upcoming things I found interesting. 1st off, Laura-Rose, who can be found at @BatsDontKill has been busy designing her Gotham City based T-Shirts for a wee bit while. I’m always on the side of people getting hyper and turning that passion into something tangible. When she’s not working at Nostalgia & Comics in Birmingham, Laura can be found playing Batman: Arkham Origins, being endearingly excited at everything Scott Snyder, Greg Capullo and Sean Gordon Murphy have to say on Twitter and shouting at telly. Hello, Laura, So, Nightwing much? Hey Nevs! 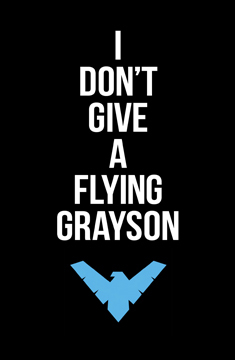 Haha, yeah, Nightwing. I’m a huge Comic Book fan and the BatFamily is pretty much my vice. 2) Tell our readers about the design concepts you used for your shirts. 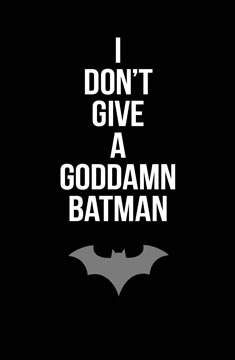 Well as I said I’m a huge fan of the Batman Universe and the mythology behind all the characters there. This also lends itself quite well to my fashion choices and I’ll never pass up the chance to wear something that advertises my favourite fandoms as it were. It also helps that I’m a Graphics student and I’ve studied Typography at University for the last four years so that helped me a lot with making it not only appeal to fellow Batfans but also hopefully ring well with other designers who can appreciate the aesthetics behind the design too. 3) Is this something you’ve been wanting to do for a while? The brilliant simplicity of your design leads itself to lots of variations on the theme you’ve established. It’s something I’ve debated for a while but never really had the confidence to take up, but having Nightwing and all the Robin’s as your favourite characters and living in England can be pretty crappy as there isn’t much merchandise for them over this side of the pond so I thought, ‘why not?’. As for the design, I like fan-related-things that are subtle to others around you unless someone else is a fan too, and you can both enjoy that inside knowledge. I did the same thing with my two tattoo’s as one is a quote from Christopher Nolan’s Inception and the other is 5 small Bats to represent the five Robin’s in the main Bat-continuity (Pre52), things you wouldn’t know if you weren’t aware of those “universes” and I wanted to take this approach with the t-shirts too. I also chose to make the design pretty simple so I can use it for various Batman-related characters. I’ve made a few for a number of the BatFamily members but there’s so many characters throughout the Batman mythos that it’s almost never-ending. 4) What other ways do you express your creativity? I know you’re mad keen for Tumblr. v>Haha yeah, tumblr is the bane of my existence, a lot of time is As I said up top, I’m a graphics student so I dabble in and out of designing things. University is where most of my creativity is going at the minute sadly as I’m in final year and it takes a lot of time. I have been working on a Steampunk Nightwing costume to wear at ThoughtBubble though, and I tend to do drawing and painting now and again. I also like making craft-jewellery and with Christmas coming up I’m going to no doubt make some presents for people, it’s not only a way of saving money but it can also mean a lot more giving someone something you made. 5) Finally, who would you most like to see wearing one of your shirts? Just the fact that there are people interested in my designs means more to me than you can imagine. My dream person to be wearing one of them would be some of the awesome Comic Book people who have worked on some of my favourite Bat-related books; Scott Snyder, Greg Capullo, Patrick Gleason, Peter Tomasi, Dustin Nguyen, Marcus To, and so on and so forth, but of course there’s the copyright issues with DC, so that’s perhaps a dream too big obviously haha. Laura intends to get the T-Shirts out next year, so go follow her. She may well be running around at Thought Bubble dressed as Steampunk Nightwing. I’ve gone on at great length of the need for suitable and amusing comics for younger readers that work on the same levels that Disney and Pixar do. Enough to engage the kids and amuse the adults. 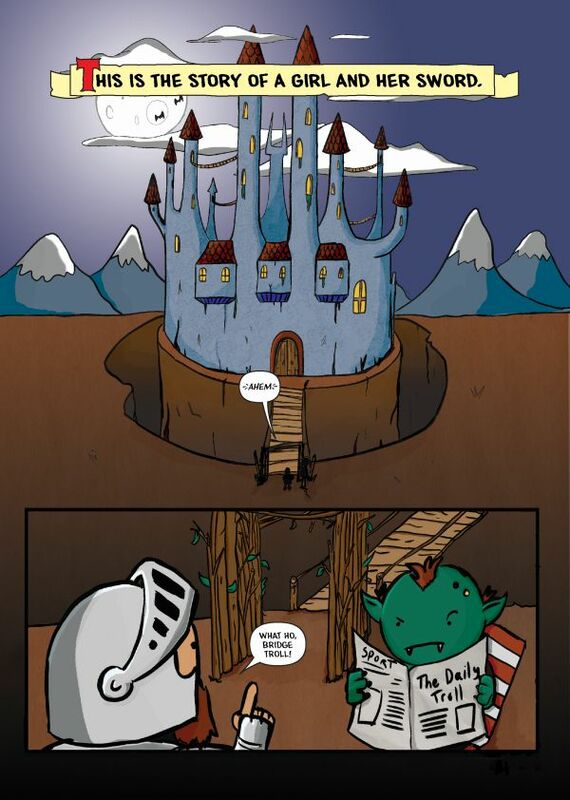 So it was good to be sent ‘Dungeon Fun’ from series writer Colin Bell (Who can be found generally heckling the world and trying to sell his endless comic collections on Twitter.) after my appeal last week to comic creators to let me give them a signal boost. 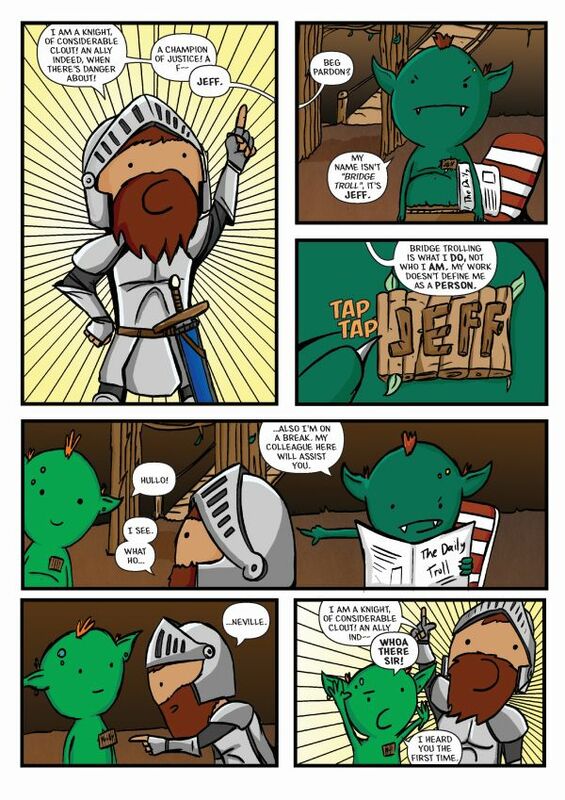 Dungeon Fun is swords and funnies for all ages, with that deceptively simple art style by Neil Slorance that I was hard pushed to find a comparison for. My 1st thought was a less busy Jamie Smart, but it’s actually more like recent Xbox Live games ‘Castle Crashers’ and ‘Raskulls.’ The story is a sweet take on ‘Girl discovers greater destiny via Mystic MacGuffin in Medieval times.’ but with a refreshingly lack of cynicism on the dialogue. I liked it a lot, and hope you do too. 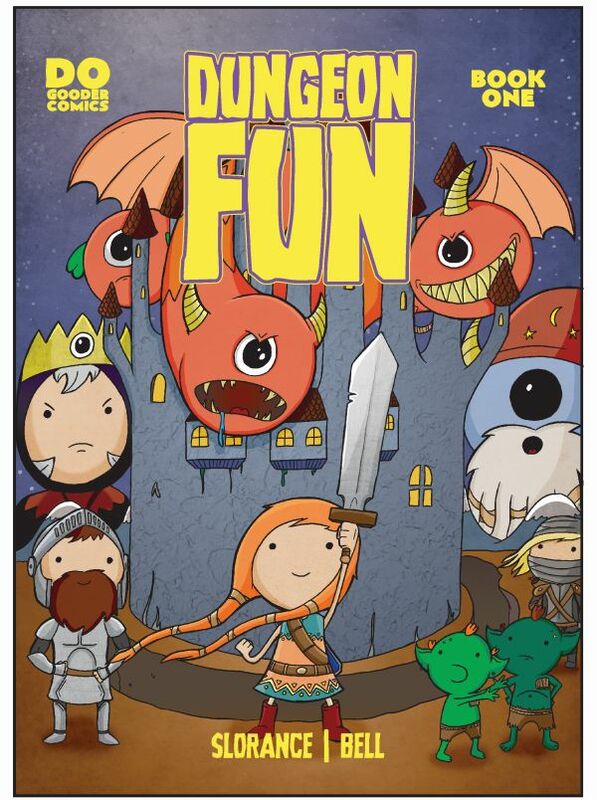 Dungeon Fun goes on sale this Weds (The 20th Of Nov.) and Plan B books is Glasgow is holding a launch party before getting its proper launch at, again, Thought Bubble. Any other questions can be asked of the lads over on their website (If this column goes out after the launch date, sorry boys, I sent this off Monday morning. promise.) 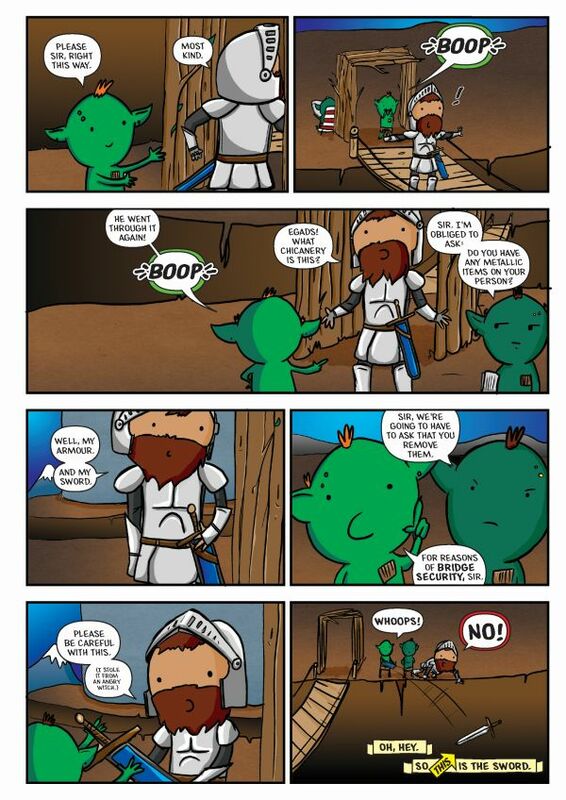 and the full preview can be found here. Last thing, and perhaps something I should have made clear when I asked for people to send me their comics for exposure last week is that everything sent to me will go through what I call Nev’s Netflix Test.. There isn’t a special fund for comics. What I find a lot of people in the self-publishing world don’t understand is that the general populace only have a limited disposable income. There isn’t a special fund for comics dispensed by a benevolent Arts Grant or anything. I hold to the idea that ANY company is pushing it if they want $5 or more for one comic (and the low sales of Vertigo’s American Vampire and other specialised anthologies like Strange Adventures or Mystery In Space.) I understand all the reasons in the world for charging more for something with a lower awareness in the comics sphere, but frankly, that isn’t anyone else’s problem. Charging the readers more because you don’t have Disney or Time Warner’s advertising machine behind you seems petty and spiteful. I’m entirely aware that you may perceive your work as content on a higher plane than your Spideys or Batman comics, but once it hits the comic shelves, everything is levelled out. It’s simply one more title in an over populated medium and the last thing you want to be doing is justifying the cost to people who are already looking for reasons to jump off the regular stuff that they’re comfortable with, let alone adding your shiny paper, hand knitted thing that ultimately, per issue, costs more than this month’s Netflix subscription. I’m sure the book sells very well to your friends. If you want to keep your audience to an exclusive, elitist group who has the kind of money to throw around on that kind of thing, you’re more than welcome to do that. That’s it for this week. I’m still trying to break down my theory of the comics world and fandom in general is a legal simile of a cult crossed with the drugs trade into one column. Maybe next time. This entry was posted on November 18, 2013 by The Filthy Nevs. It was filed under Uncategorized . Don’t usually comment on blogs, but the ‘Netflix Test’ is ace, and should be aggressively proselytized far and wide. I work in a comic shop, and the number of times people have turned up to sell us their indie books (some are ace, some are arse, most are middling-to-fair) and displayed a total lack of awareness of the value of their own output in the context of what’s on the racks is staggering. Sam Humphries said it best with the following; “There is no handicap for being up and coming or self-published. You are up against every other creator out there.” And when that means Batman is (usually) under £3, that’s the benchmark you work to; no exceptions.